Forget rising copper and oil prices. 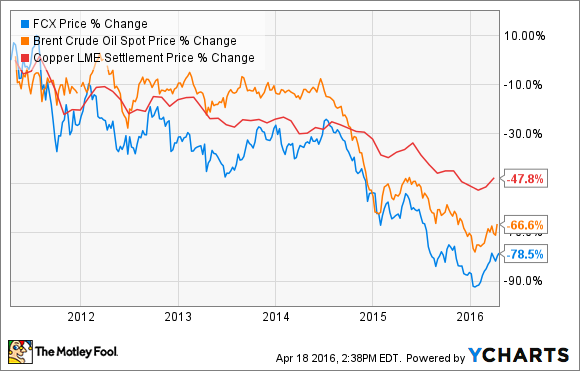 Freeport-McMoRan investors want to see this number fall. That said, slumping prices have weighed heavily on the stock because the company is carrying a whopping $20.4 billion in debt. While that number alone isn't the issue, given that peer BHP Billiton (NYSE:BHP) has $10 billion more debt outstanding, the problem for Freeport is that it has too much debt for a company of its size, at less than half of BHP Billiton's size as measured by assets. The concern is that its debt is getting a lot harder to manage at current commodity prices, which is why its debt is the only number that matters to investors right now. Freeport-McMoRan originally loaded up on debt to buy its oil and gas business in 2012 in order to join BHP Billiton as an elite global resources company. However, that came at a steep cost, with Freeport-McMoRan's debt growing from $3.5 billion to more than $20 billion as a result of its buying binge. It felt confident it could afford that binge because of its bullish view on global commodities, which led it to believe that it could quickly pay back the bulk of its borrowing with cash flow generated from triple-digit oil prices. However, oil quickly turned south, soon joined by copper, which put an end to its original repayment plan. Furthermore, it was able to work out an amendment with its lenders to provide some additional flexibility on the financial covenants for its bank term loans. For 2016, its leverage covenant has been increased to 8.0 times through the first three quarters before dropping to 6.0 times in the fourth quarter. That gives it a lot more breathing room should commodity prices take a turn for the worse, especially considering that its year-end leverage ratio was just 4.2 times. It still, however, needs to address its debt before its time and breathing room run out. The good news here is that the company has a number of options at its disposal. First of all, it has cut its capex spending back significantly, which should enable it to generate a few hundred million dollars in free cash flow this year to go toward debt reduction, assuming commodity prices cooperate. In addition to that, it is moving forward with a number of asset sales. It has already announced a $1 billion sale of a minority stake in its Morenci mine and plans to use that cash to pay down its term loan. Meanwhile, it's said to have reportedly offered to sell a minority stake in its Grasberg mine, which could bring in up to $1.7 billion of additional cash for debt reduction. Also, it's exploring all possible strategic options for its oil and gas business, including a partial or full sale of that business. Finally, it has multiple additional mining assets that could be sold to bring in cash. Needless to say, it does have a lot of options at its disposal to begin whittling down its debt. That said, what investors want to see is the company make additional asset sale announcements. In particular, the company is supposed to have $3 billion in asset sale announcements by the end of this June in order to meet the new conditions under its agreement with lenders. If it fails to meet that number, additional provisions kick in, which would reduce its financial flexibility a bit. Given the sheer volume it owes, the most important number for Freeport-McMoRan investors to monitor right now is its debt. While the company does have time and options, it's still operating under the microscope, with its lenders wanting to see action by the end of the current quarter in order to stay in their good graces. That's why investors will want to keep an eye open for any asset sale announcements, because these will enable the company to reduce its debt and provide it with a bit more breathing room as it waits for commodity prices to improve.